St. Patrick's Day isn't far away and as always, Disney's FamilyFun Magazine has loads of cute ideas to make your holiday a success. St. Patrick’s Day Scavenger Hunt: Follow fun all the way to a faux pot of gold. Green Stamp: Spread the luck o' the Irish this St. Patrick's Day with a homemade shamrock stamp. Use it to decorate paper place mats, coasters, tablecloths, or anything else your little leprechauns wish to dress in green. Clover Cookies: For St. Patrick's Day (March 17), or any day you feel like you need a little extra luck, bake up a batch of these cheerful green shamrock cookies. Give some to your friends and classmates, so they will be lucky, too. 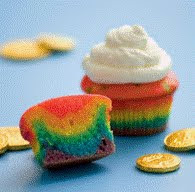 Taste a Rainbow Cupcakes: Here's what little leprechauns look forward to on St. Patrick's Day: a magical snack that can add color to the grayest March afternoon. Pot of gold not included. Luck of the Irish Cupcakes: It's not far to the gold at the end of this rainbow-topped Emerald Isle cupcake, just the thing for your lads and lasses on St. Patrick's Day. Shamrock Cupcakes: It doesn't take the luck of the Irish to make these St. Patty's Day treats look so sweet -- just a clever baking technique. St. Patrick’s Pot of Gold: Surprise your favorite little people on March 17th with these wee emerald pots filled with sweet, edible gold. Permission to print from FamilyFun.